Ocean Thermal Energy Conversion (OTEC) is a base-load energy generation system that utilises the differential temperature of about 20°C, between the warm seawater at the oceanic surface and cold seawater at around depths of 700-1000 meters. This creates a potential for tropical regions – a prospect that has been explored by various countries such as Japan, France, United States and the Netherlands. Since 2013 Malaysia, through the OTEC Centre of Excellence under Universiti Teknologi Malaysia (UTM), aggressively promotes OTEC development nationwide. The focus is not only on electricity generation, but also hydrogen production to maximize economic potential. As meeting energy demand is an area of national importance because it supports social well-being and economic growth, the Government is always monitoring current and long-term energy needs. Malaysia currently has a capacity of 29,944 MW of electricity, with a recorded peak demand of 16,901MW (leaving a surplus of 4,043MW). Energy sources include coal, piped gas, LNG and hydro. The Organisation for Economic Cooperation and Development1 (OECD) has consistently predicted expanding worldwide markets for renewables. This reveals some potential for OTEC development and construction. 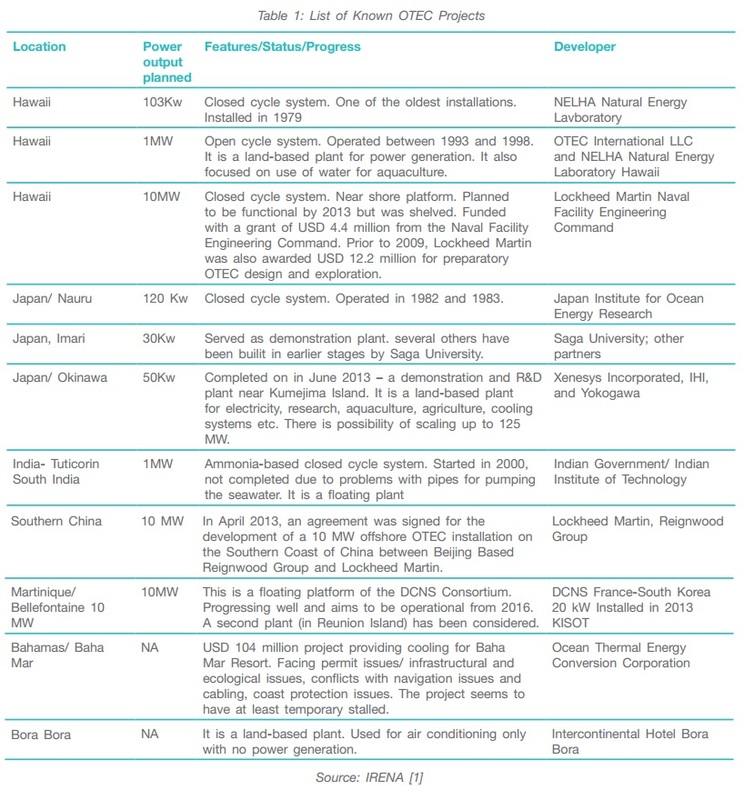 It is anticipated that by the year 2020, the demand for OTEC in the Asia Pacific Region would be 20GW. The demand may rise to 100GW2 in 2050. However, according to the World Energy Council3, this projected growth would be highly dependent on the early operation of the technological demonstrators. A recent study by the French Department of Energy revealed that the global potential for OTEC is a weighted installed base of 150GW, with a priority market of 6GW emerging on islands and 9GW in isolated areas. By 2030, 1.5GW of OTEC should be installed”4. Over the last decade, more efforts have been concentrated on the research and development of OTEC. The report published by International Renewable Energy Agency (IRENA)5 provides a useful perspective of OTEC potentials worldwide. International OTEC Symposiums were held; in Hawaii in 2013, followed Busan, South Korea in 2014 and in Kuala Lumpur, Malaysia in September 2015, in attempt to link up OTEC-related stakeholders and share relevant knowledge and experience on the development of OTEC. The first known OTEC system was proposed by the French Engineer Jacques Arsene d’Arsonval in 18816 using a closed-cycle system. His student, George Claude furthered his work and was the first to demonstrate the open-cycle system in Cuba during 1930s. On October 6, 1930, Claude’s team started a 22kW generator and lit up an array of lamps. The plant operated for only 11 days, as it was destroyed by a storm. Dr. Claude made a second attempt in Brazil, to produce ice. This also failed due to a storm7. The research and experiment were discontinued due to lack of financial viability and declining fuel prices8,9. Jacques d’Arsonval initial work was resumed almost 100 years later by France’s IFREMER in the 1970s, and today by DCNS. DCNS decided to invest in OTEC because of its already-available technical know-how and to fulfil the competency requirements of systems engineering10. As of 2012, DCNS has 13,183 employees, 2.9 billion euros in revenue, 14 billion euros in its order book, with 1/3 of its revenue from international sales.11 DCNS’ resources include 30 team members from the thermodynamical engineering and system engineering sectors, naval architects, heat exchangers, risers, mooring systems, and ocean survey equipment (among others)12. 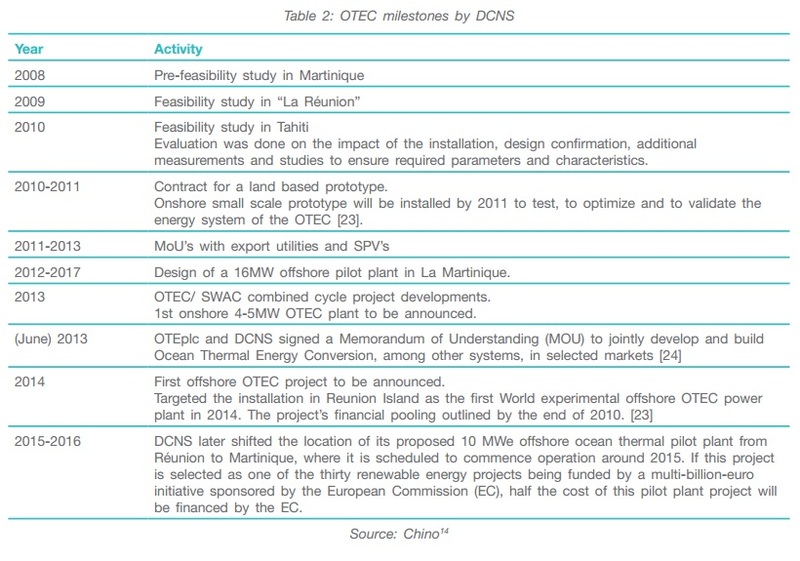 As France is a pioneer for the OTEC industry, key OTEC players include DCNS; the Ocean Thermal Energy PLD (OTEplc, a UK-based financing company which recently became a partner of DCNS); French Research Institute for Sea Exploitation; Ministry of Ecology, Sustainable Development, Transport and Housing; International OTEC/DOWA Association; and La Martinique Regional Council. DCNS has established research and development work in Brazil, Ireland, Belgium, Saudi Arabia, India, Malaysia and Singapore. Several OTEC projects have also been carried out in Hawaii, Japan, South India, Southern China, Martinique, Bahamas, Bora Bora and Tetiaroa. The features/status and progress of the projects are presented in Table 1. Japan, in her effort to comply with the Kyoto Protocol, which calls for the reduction of her greenhouse gas emissions by 6% of the 1990 level, proposed to build OTEC plants in Indonesia in a carbon emission exchange programme. Lockheed Martin, a US-based company, has formulated a market entry strategy for OTEC by identifying the convergence point among countries with availability (temperature gradient), dependency on oil markets and limitation of other renewable sources. Apart from the commercial market, it targets the Department of Defence as potential customer. Lockheed Martin estimated a production capacity of between 10MW-100MW is required to fulfil the demand of these markets. Foresight and Roadmap as part of a comprehensive multi-national vision, strategy and collaboration effort. At the same time, it will conduct fundamental and applied OTEC research, develop a stable market structure for OTEC and identify areas suitable for further development. 1. Organisation for Economic Co-operation and Development, Energy: the Next Fifty Years, 1999. 2. M. (IOA) Gautheir, L. (Norweigan I. for W.R. Golmen, D. (Ocean T.E.C.S.L.Lennard, Ocean Thermal Energy Conversion (OTEC) and & Deep Ocean Water Applications (DOWA). Market opportunities for European industry, in: New Renew. Technool. Sustain. Dev., Madeira Island, Portugal, 2000: pp. 1-7. 3. World Energy Council, Survey of Energy Resources 2001, 2001. 4. Ocean Energy Europe, Ocean Thermal Energy Conversion, (2014) 1. http://www.oceanenergy-europe.eu/index.php/oceanenergy/technology/13-technology/49-oceanthermal-energy-conversion. 5. L.C. des Argonautes, Dossier Ocean et Energie – EnergieThermique des MersOTEC : A neglected marine energy renewablw (2005) 1-3. http//www.clubdesargonautes.org/energie/promoetmvva.php (accessed January 10, 2014). 6. P. Takashi, A. Trenka, Ocean Thermal Energy Conversion, John Wiley & Sons, New York, 1996. 7. J. Marti, Ocean Thermal Energy Conversion (OTEC) Implications for Puerto Rico, in: Presenation to PRW&EA Annu. Meet, 2008. 9. Eurocean, Renewable Energies-OTEC, (2014) 1-5. www.european .org/np4/124.html (accessed January 10, 2014). 10. Ernst & Young, Ocean Energy Opportunities in the French market, 2012. 11. F. Chino, OTEC is Now, in: OTEC AFRICA Oct 15th – 16th 2013 BORAS – SWEEDEN, 2013: pp.1-9. 12. F. Chino, OTEC is Now, in: OTEC AFRICA Oct 15th – 16th 2013 BORAS – SWEEDEN, 2013: pp.1-9. 14. F. Chino, OTEC is Now, in: OTEC AFRICA Oct 15th – 16th 2013 BORAS – SWEEDEN, 2013: pp.1-9.